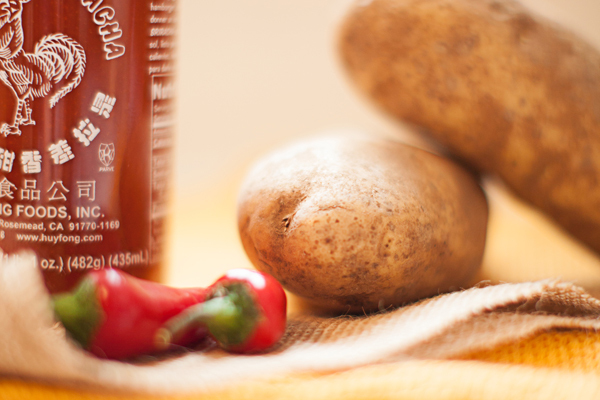 Sriracha lovers are a special breed. The hot pepper sauce is the equivalent of Asian ketchup – die-hard fans, like my friend Kenton, will put it on almost anything. And the more the better. So when Lay’s announced the finalists for its Do Us a Flavor contest this spring, and Sriracha was one of the three flavors Americans wanted most, I knew many of my friends wouldn’t be able to resist. But then, Sriracha didn’t win. The Garlic Cheesy Bread did. So what were my friends like Kenton to do when they crave that crunchy, spicy, impossible-to-pronounce condiment? Well, turn to us, of course! 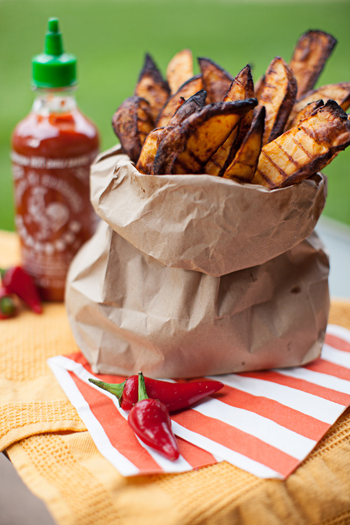 Snack or side, these Sriracha Oven Fries are super simple, exceptionally crisp, and as spicy as your tender taste buds can handle. 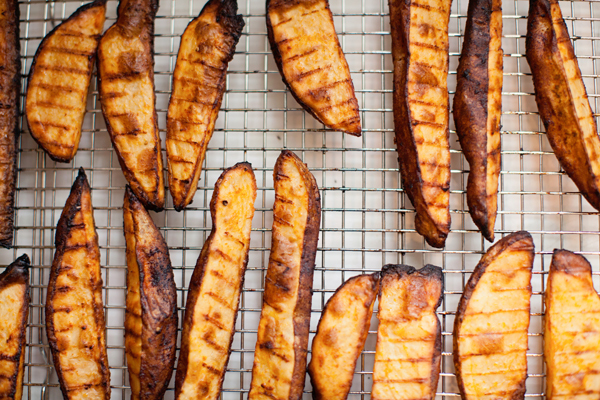 We take hearty Russet potatoes, slice them in to wedges, and then soak them for an hour or two. This step means you have to plan ahead, but man is it worth it! Have you ever made oven fries and felt defeated with every mushy batch you removed from the oven? Well, those days are gone. Soaking the potatoes allows the starch to leach out, starches that prevent moisture from evaporating during the cooking process. That moisture stays trapped inside the potato and leaves you with a squishy fry. By removing the starch, your potatoes will crisp up exactly as you’d hoped. Once the potatoes have soaked, drain them and thoroughly pat dry. A kitchen or paper towel will work. Then, toss together that Sriracha with olive oil and a pinch of salt and pepper. We found that four tablespoons of the hot sauce was a crowd-pleasing amount. My Sriracha-fiend friend enjoyed them, our Lacy J. Hansen with milder taste was fully able to eat them, and with a glass a milk an adorable nine-year-old boy even got in on the munching. Obviously, add more if you like or tone it back if you need. Arrange the potatoes by lying them flat on a wire rack, as this will allow air to move around the potatoes and help that crisping occur. Finally, pop ’em in the oven. Keep an eye on them, but after 20 or 30 minutes you should have crispy, crunchy, spicy fries, and because of the rack you won’t need to flip. 1. 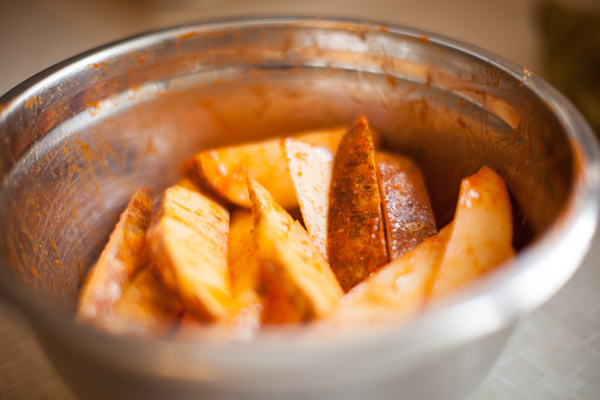 Wash the potatoes and slice in to wedges, about 1/3″ thick. 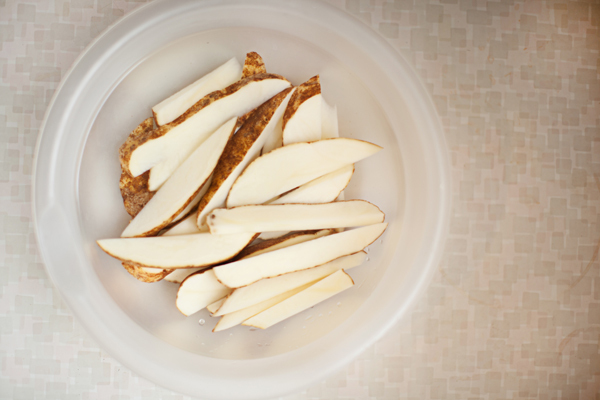 Fill a bowl with water and soak the wedges for one to two hours. 2. Preheat the oven to 450 degrees F.
3. Combine the Sriracha, oil, and spices. Set aside. 4. Drain the potatoes and thoroughly pat dry. Then add to the sauce and toss until thoroughly coated. 5. Lie the potatoes flat on a wire baking rack, place in the oven, and bake for about 20-30 minutes. Try More Recipes from the DietsInReview.com Kitchen! Can’t see video? 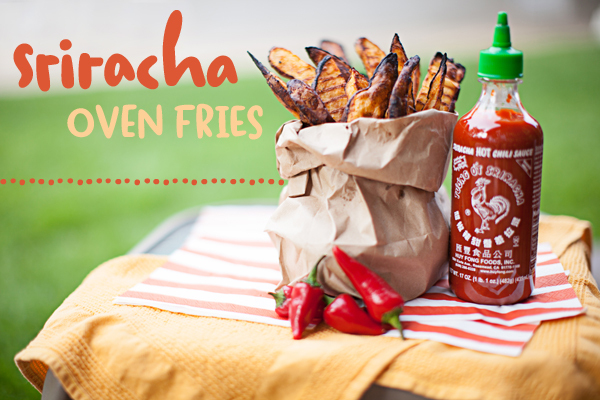 Watch the Sriracha Oven Fries video here.